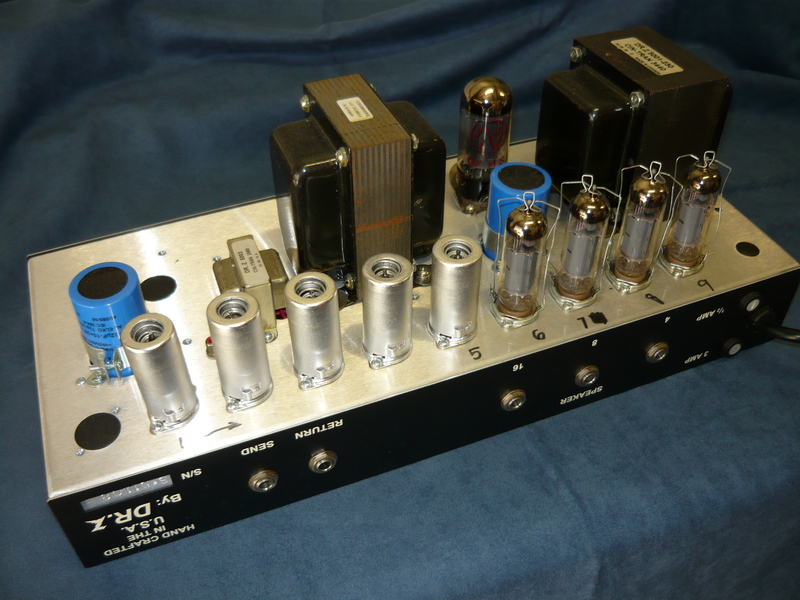 Yes, we specialise in the service & repair of boutique, ie hand-wired, all-valve (tube) musical-instrument amplification, including Dr-Z from the USofA. 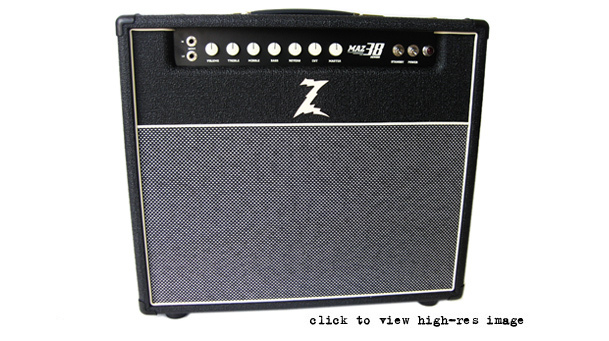 The subject of this week’s amp repair blog is a Dr-Z MAZ38 (Senior) 2X12 reverb combo, shipped up to our Wyoming (NSW) workshop from Sydney by a regular customer. This particular MAZ38 was blowing fuses. There are actually two fuses fitted on the rear panel, one is the 240V mains fuse, the other is a secondary fuse for the high voltage supply, and would normally be around the 0.5A (500ma) value. In this case the mains fuse was blowing, although when I examined the HT fuse I found an 8A fuse rather than a 0.5A fuse, which would result in negligable protection. The fact that the mains fuse was blowing tends to suggest a fault in the power supply, and this proved to be correct. The fault was isolated in a series of diagnostic steps to the power transformer itself, which had developed an internal short-circuit. 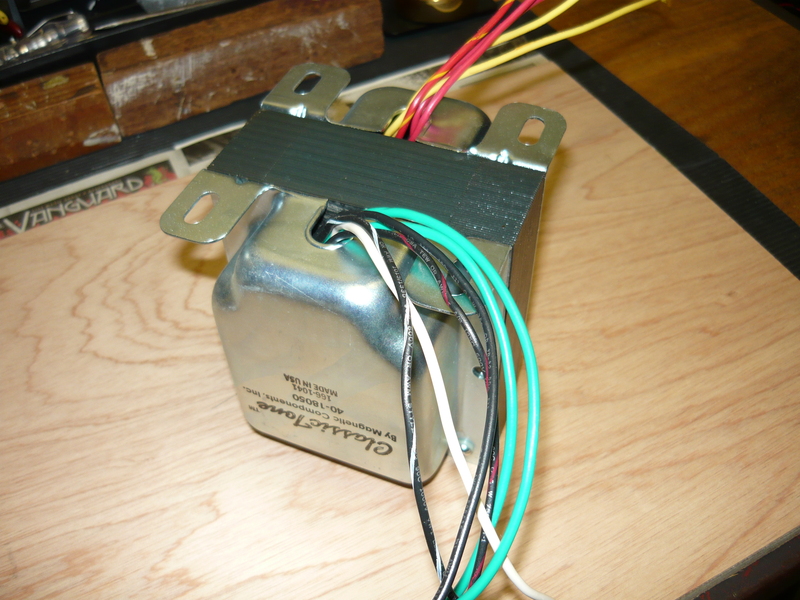 The quad of EL84 output valves was still serviceable, but the GZ34 rectifier valve was definitely short-circuit. Was the GZ34 the original problem, or the transformer ? We shall never know, but this was developing into an expensive repair job for the customer. Removing the faulty transformer and installing a replacement was going to be a tricky operation, as access to where wires need to be disconnected and subsequently reconnected is limited. Most of the internal space within the chassis is taken up by a single large board holding the majority of the resistors and capacitors, with hand-wired connections from both sides of the board. The standard of construction as well as components is high, as you would expect, but access to some components for service is poor. It turned out upon investigation, that the power transformer is rated at 230V AC. But, here in OZ our mains voltage is actually 240V nominal, but is often quite a bit higher than that, especially over in W.A. There was going to be a delay sourcing the original transformer from the factory anyway, and we wanted to move quickly on this job, so at the customer’s suggestion I selected an after-market replacement power transformer. I chose to install a Vox AC30 replacement manufactured in Chicago, Illinois USofA, by Magnetic Components Inc, and marketed under their “Classic Tone” series. 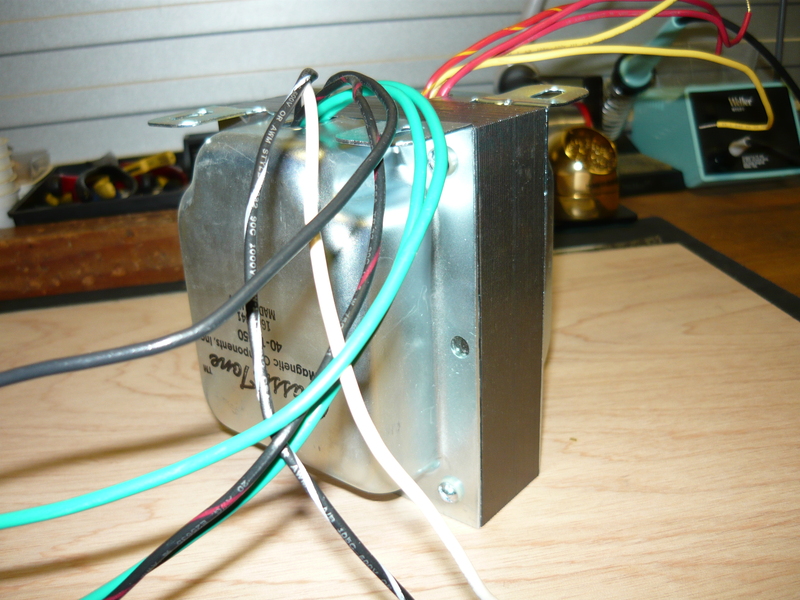 I have sourced a transformer from this manufacturer previously with success, so I had no hesitation to use them again. I originally read about Magnetic Components in TQR, by the way. Check out the transformer photos ! This monster is spec’d as per the original Vox AC30’s, but most importantly it is rated for 240V AC, by means of connecting the two 120V primary windings in series. In spite of the imposing bulk of this transfmr, I was able to locate it on the existing MAZ38 chassis, with a couple of additional mounting holes, and nylon grommets to feed the wires safely through the access holes. After making all the necessary connections, which included adding a pair of 100 ohm resistors to provide a centre-tapped ground connection for the 6.3V AC heater supply, and also installing a new JJ GZ34 rectifier valve (tube), we powered up the amp without any further dramas. The amp chassis was subjected to the usual range of quality-control testing: power output test into a resistive load, burn-in test, electrical safety test (to Workcover NSW standard), and final play test into the amp’s own speakers. I was pleased to find that the new power transformer remained relatively cool during all this, one obvious advantage of bulky 50’s/60’s spec’d units with a lot of iron ! 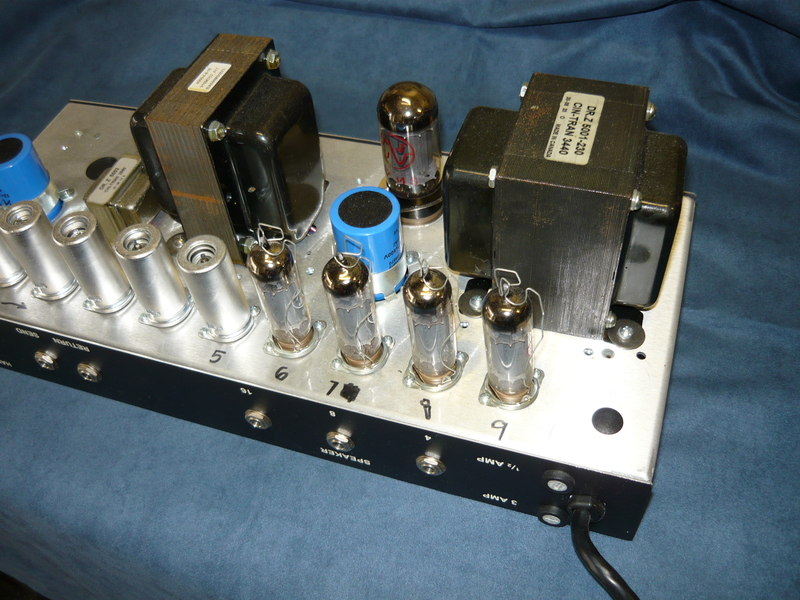 Many thanks to Shane for his continued custom and for providing us with this week’s amp repair blog. Please visit us again soon for more amp and pedal blogs, we try to create a fresh blog every week, time permitting. This entry was posted on August 6, 2011 at 11:30 am and is filed under Amp Repair, Amps. You can follow any responses to this entry through the RSS 2.0 feed. You can leave a response, or trackback from your own site.